Tell us your story and why you are endorsing Stephen. Please fill out the form on the (right). You can also add a video testimonial with a youtube link or upload a photo. “He's the best person for the job - honest, hardworking, came up the hard way & didn't forget where he came from. We don't need someone that's been around forever to continue representing us. A vote for Steve is a vote for all of us. “My name is AJ Castilla and I am U.S. Navy combat veteran. For ten years I worked for the U.S. Department of Homeland Security's sub-agency, the TSA. Just after 9/11, when thousands of my comrades and I were illegally underpaid and improperly denied Veterans Preference required by law, we sought equal rights and protections to combat these abuses. Even before we joined the nation's largest federal employees union, A.F.G.E and an even larger family of eleven million AFL-CIO members, Stephen cast his first votes as a then newly elected U.S. Representative - to restore collective bargaining for 50,000 TSOs nation-wide. When we requested a federal investigation into graver management abuses at Logan Airport, Stephen again...was there. Later, when our employer refused to provide us proper safety equipment; like protective masks during the deadly world-wide H1N1 flu epidemic, he gained Republican support and forced the TSA to issue them to us. Like-wise, when our employer refused to allow us to wear radiation detecting dosimeters at our own expense despite years of questions into the safeness of our screening technology - Stephen again, was quickly there whereupon he called a Congressional hearing so we could be heard. 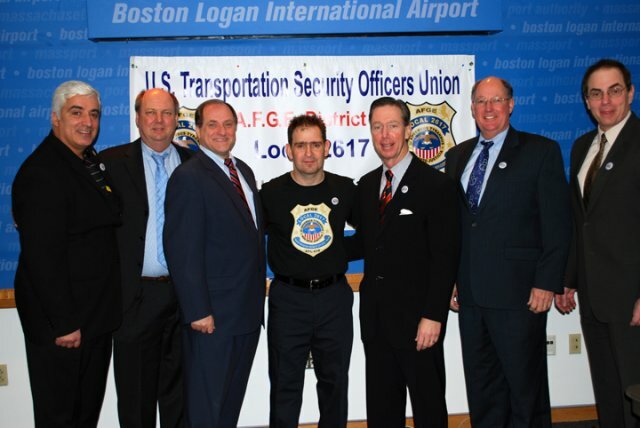 After being told of our Logan Airport TSOs incurred unusual cancer rates, he reached out in yet another bi-partisan act getting Senator Scott Brown, R-MA, Susan Collins, ME and others...to press TSA to provide more credible inspection of body scanners and x-ray data. Now those potentially dangerous machines have been removed, thanks to Stephen. “People who oppose Steve Lynch subliminally challenge, or at least attempt to minimize, his credibility on issues that working class Americans admire. They are entitled to their opinions. They are not entitled to their set of facts. Steve Lynch is a product of the Old Colony Housing Project. He graduated high school and was selected for an apprenticeship in Iron Workers Local 7. While he performed admirably, and was elected president of our local union in his early 30s, he chose to continue his formal education. Having worked on numerous ironworking projects with Steve during his 18-year career,  I can say, without equivocation, that he was a tireless and fearless worker, and a particularly strong advocate for his brothers and sisters. This period of his life, while laudable, did not quench Steve's resolve for fighting for working families. He went to school at night and received his degree, and eventually graduated from Boston College Law School. Naturally, some of his earliest clients were people who were similarly situated to Steve when he was young---residents of the housing project where he grew up. Defending or advocating for regular people courses through his veins. Many people have underestimated Steve's resolve to their own peril. He couldn't win that state reps' seat; he couldn't win that state senate seat; he'd never reach Congress; and now he is "crazy" to go up against a candidate who enjoys all the high profile endorsements and has four or five times as much money as Steve Lynch. Every step of the way people doubted his ability to prevail, and in each case they were proven wrong. This is a once-in-a-lifetime opportunity to send a guy who has seen life from the perspective of an overwhelming majority of the constituents he will represent in the US Senate. He's experienced cyclical downturns in construction; he's stood in unemployment lines; he's witnessed the effects of substance abuse and fought to make a difference; he's fought for his district and his people at every imaginable level; and he's voted his conscience when it would have been easy to go along to get along. Have I always agreed with Steve Lynch? No. To require unanimity of opinion on EVERY issue is wishful thinking. If I was in a bind, this is a guy I know I can count on.